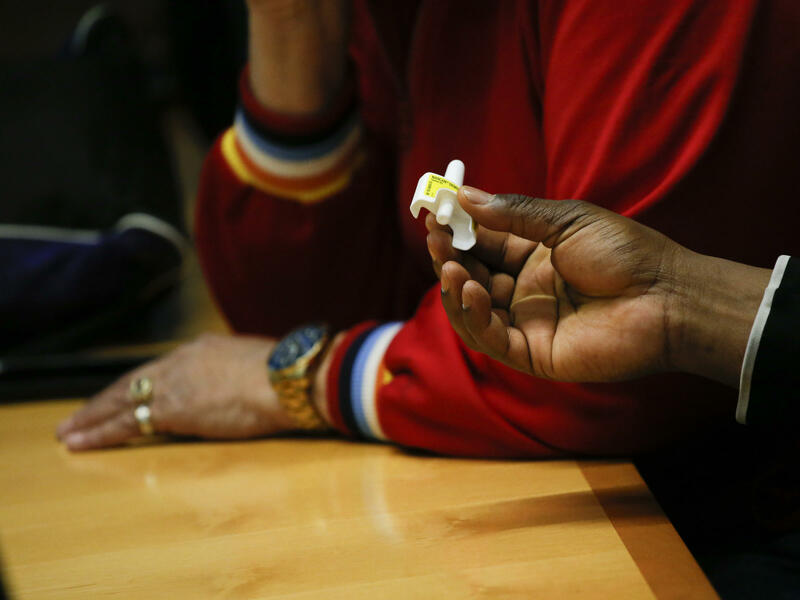 A man holds a sample of the opioid antidote Narcan during a training session at a New York City Department of Health and Mental Hygiene office in March. Nearly every state has made it easier for people to get naloxone by allowing pharmacists to dispense the drug without an individual prescription. Public health officials are able to write what are called standing orders, essentially prescriptions that cover everyone in their jurisdiction. 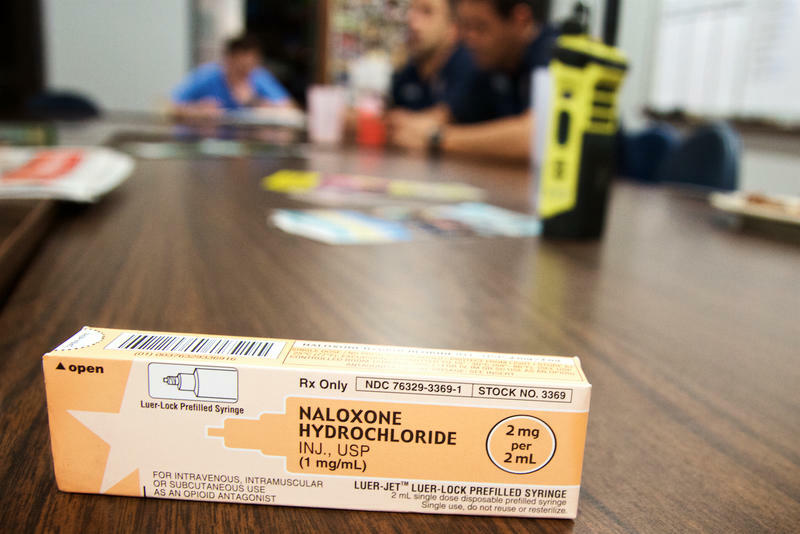 Some states require training in how to use naloxone, typically given as a nasal spray called Narcan or with an EpiPen-like automatic injection, in order for someone to pick up naloxone. But the medicine is simple to use either way. After the surgeon general called for more people to be prepared with naloxone, we decided to ask Americans about their knowledge about the opioid antidote's availability, attitudes toward using it and experience with the medicine in the latest NPR-IBM Watson Health Health Poll. The survey queried more than 3,000 households nationwide in May. We wondered how many people know about naloxone and the fact that someone doesn't have to be a medical professional to administer it. Fifty-nine percent of respondents said they were aware of the antidote and that it could be given by laypeople; 41 percent said they weren't. We then asked people who knew about naloxone if they would need a prescription to get it. The answers were pretty evenly divided among three options: yes, no and not sure/no response. "Why, with all the attention we've had in the media, why don't more Americans know about naloxone?" asks Dr. Anil Jain, vice president and chief health information officer for IBM Watson Health. "When people did know, why did people think they needed a prescription?" While the survey doesn't get at the causes, Jain says, the findings underscore the need for greater public awareness. Baltimore Health Commissioner Dr. Leana Wen says the lack of knowledge among Americans at large isn't all that surprising. "Policy alone is necessary but not sufficient," she says. "People still don't know to go to the pharmacy to get access to naloxone, especially individuals at the highest risk." To change that, she says, "you have to have continued education and the delivery of services" where people need them. In Baltimore, the health department maps where overdoses are happening and sends outreach workers to the areas. But money is an issue, even at a negotiated cost of $75 per naloxone kit, Wen says. There isn't enough naloxone to go around. "Every week we take stock of how many naloxone kits we have for the rest of fiscal year," she says. "Who's at most risk? Those are who we give the naloxone to." 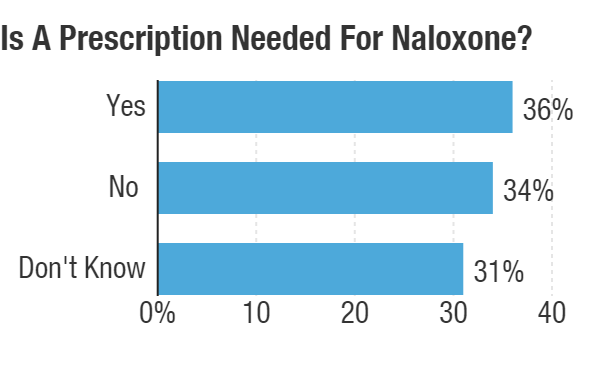 The NPR-IBM Watson Health Poll asked people if they would be willing to use Narcan, the nasal spray form of naloxone, to help a person who had overdosed. Fifty-eight percent said they would and 29 percent said no. Thirteen precent weren't sure or didn't respond. Only 47 percent of people 65 and older said they would be willing to do it. 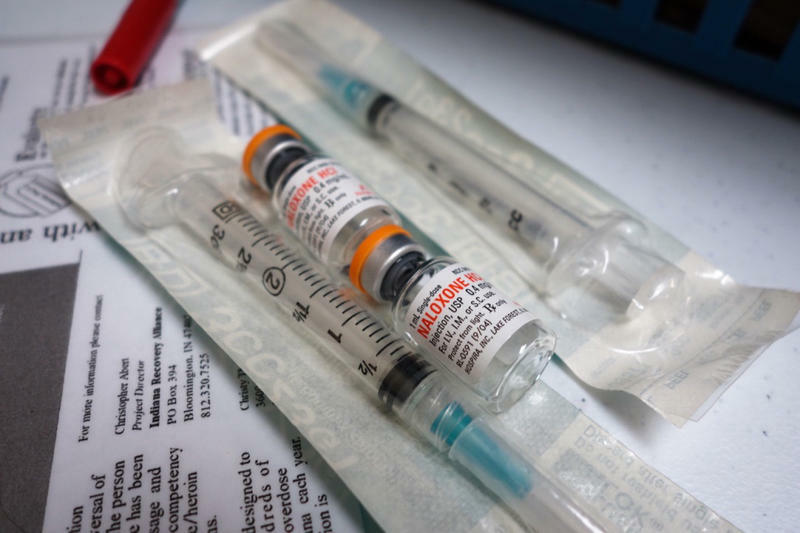 When asked about the auto-injector option, 68 percent of respondents said they would be willing to administer naloxone that way and 22 percent of people said they wouldn't be. Finally, we asked whether people had obtained naloxone, and 10 percent said they or someone in their household had. Among those people, 81 percent said the naloxone had been used, but the sample size for this question was small, making interpretation difficult. The nationwide poll has an overall margin of error of plus or minus 1.8 percentage points. You can find the questions and full results here. 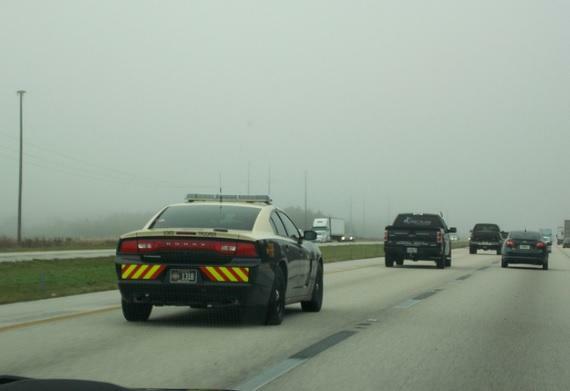 The Florida Highway Patrol announced Wednesday it is issuing naloxone, an overdose-reversal drug commonly known by its brand name, Narcan, to state troopers.